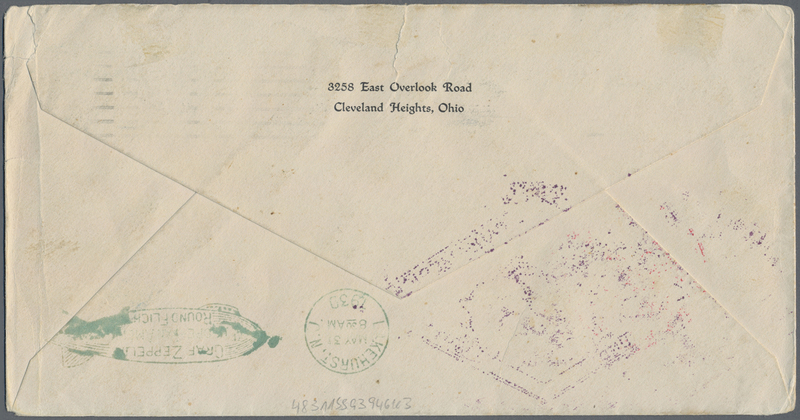 80120 Brief (cover) 1942. 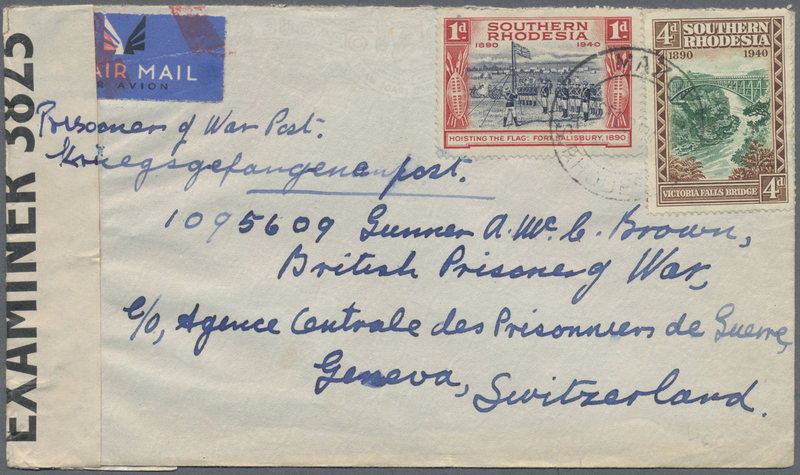 Air Mail envelope headed 'Prisoner of War Post' addressed to 'British Prisoner of War, c/o Agence Centrale des Prisonniers de Guerre, Geneva, Switzerland' bearing SG 54, 1d violet and scarlet and SG 58, 4d green and brown tied by Mazoe double ring with 'Opened by Examiner/3825' censor label. Very fine. 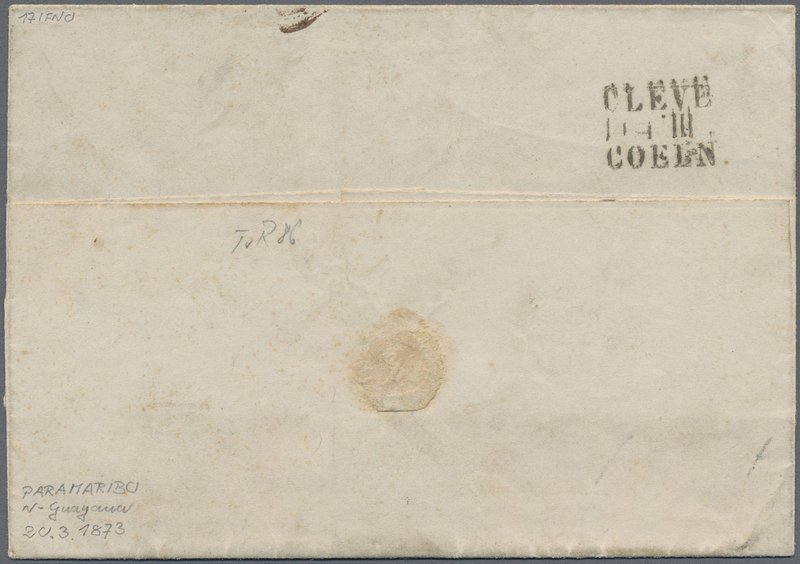 80121 Brief (cover) 1943. 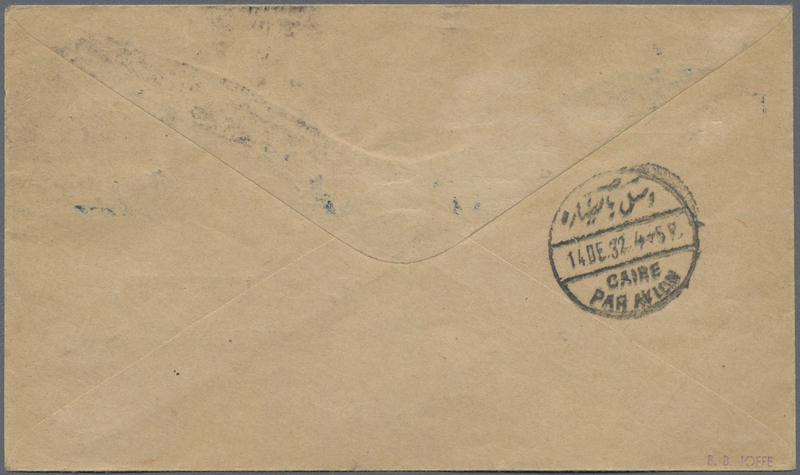 Registered Air Mail envelope addressed to Egypt bearing SG 41, 1d carmine and SG 49, 1s6d black and ochre tied by Umtali date stamp with matching registered label with 'Opened by Examiner / D.E / ...' label tied by framed 'Passed/DE/23' in carmine on face with Egypt arrival and forwarded to Middle East Forces, 6th Army Division. Superb. 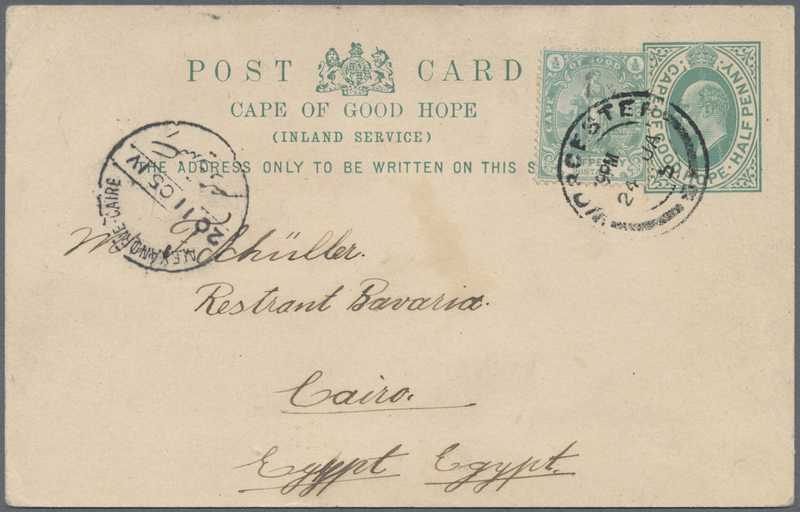 80122 Ganzsache (Complete) 1905, POSTAL FRAUDE: 1/2d stationery card uprated with two halfs of 1/2d green, one part with still visible perts of previous cancellation sent from WORCHESTER to Cairo. 80123 Ganzsache (Complete) ex SG. 244/49, RE 4 1904 (30.4. 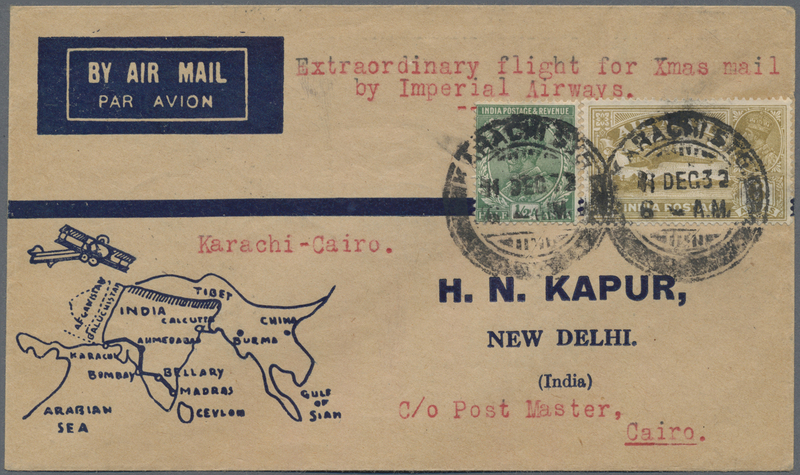 ), registered letter (long size) KEVII 4d. 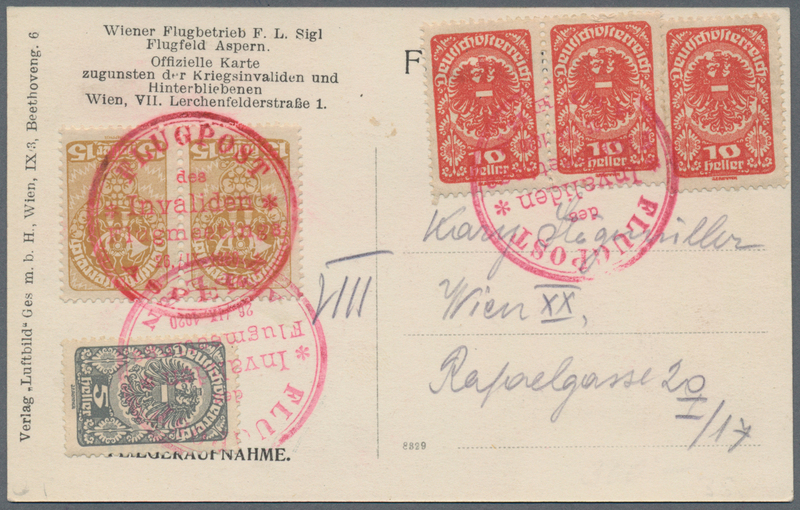 blue uprated with four different KEVII definitives used from ROODEPOORT to Leipzig/Germany with 'Registered Johannesburg' (30.4.) 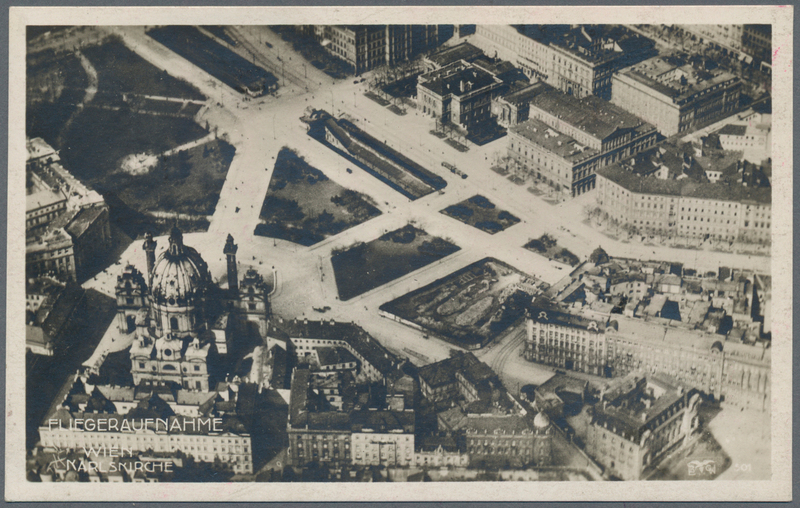 and Leipzig (22.5.) 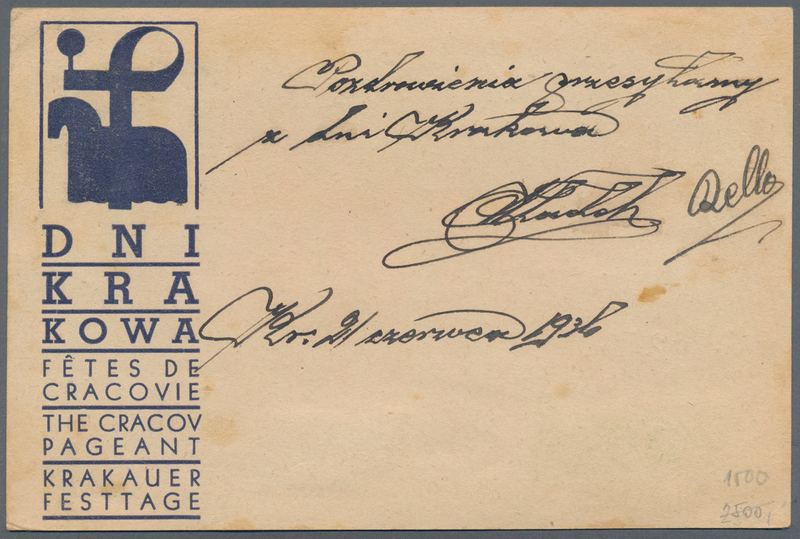 transitmarks on reverse, colourful item! 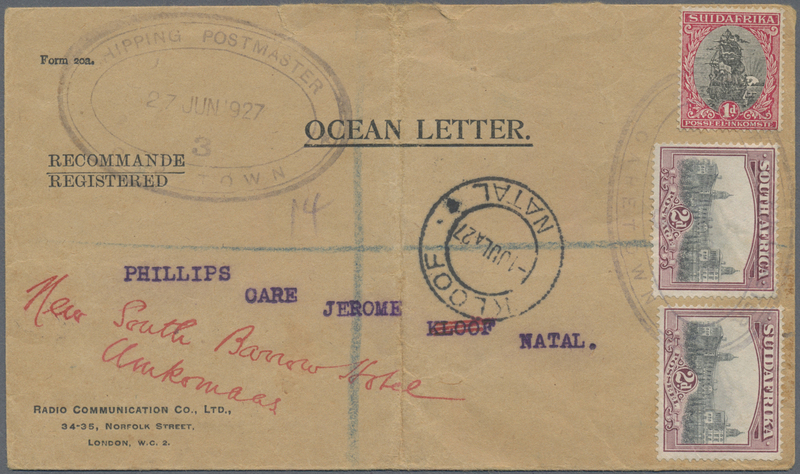 80124 Brief (cover) SG 31,34 (2) 1927, special cover "OCEAN LETTER" (fold) with rare cancellation "SHIPPING POSTMASTER CAPETOWN 3" via "CAPE TOWN DOCKS addressed to Kloof, Natal and redirected to Umkomaas. Rare shipmark, only a few known. 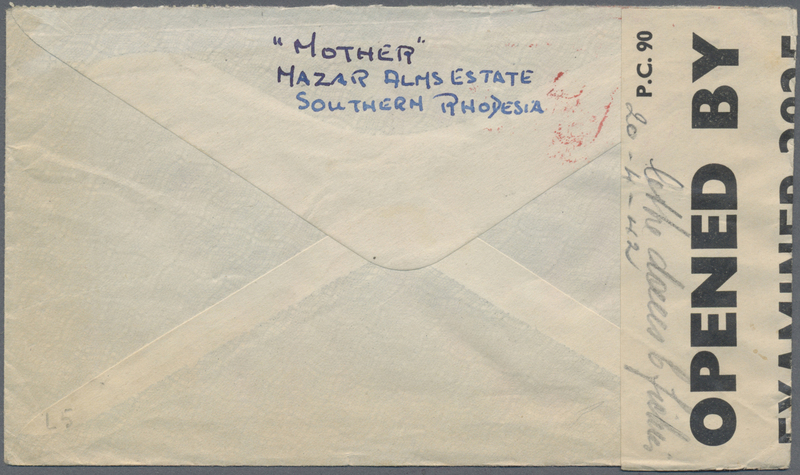 80125 Brief (cover) P 41 + GAA+ ½ d 1950, Due stamp 3 d blue/black on cover bearing a stationery aoucut 1½ d and stamp ½ d locally used in Port Elizabeth 3.10.1958 + english/boers violet 2- line canc. 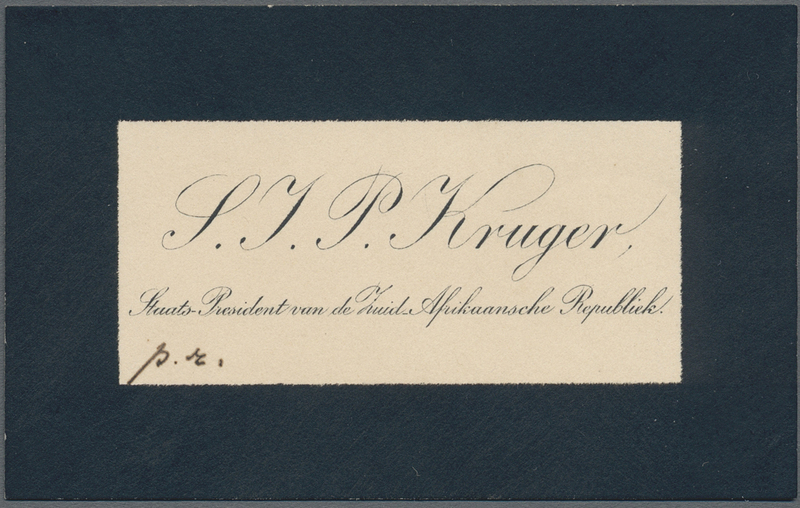 "INSUFFICENTLY PREPAID"
80126 Brief (cover) 1901, BOER WAR: personal condolence by President P. KRUGER sent from "HILVERSUM 8 AUG. 01". 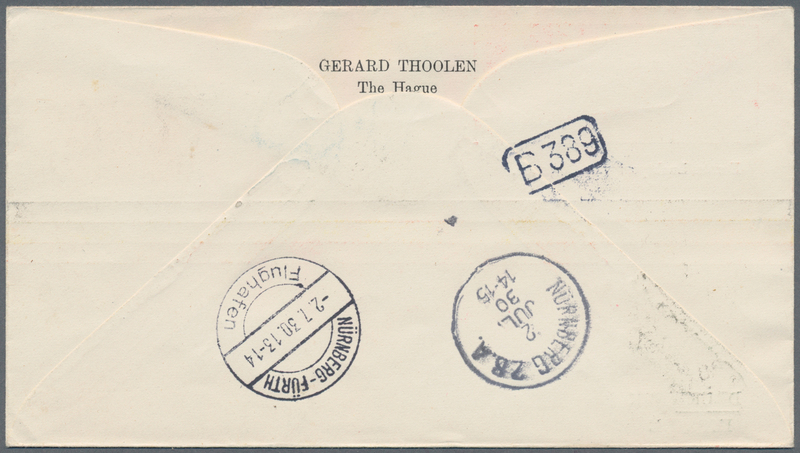 President Kruger stayed in Hilversum from 06-04-1901 till 11-12-1901. 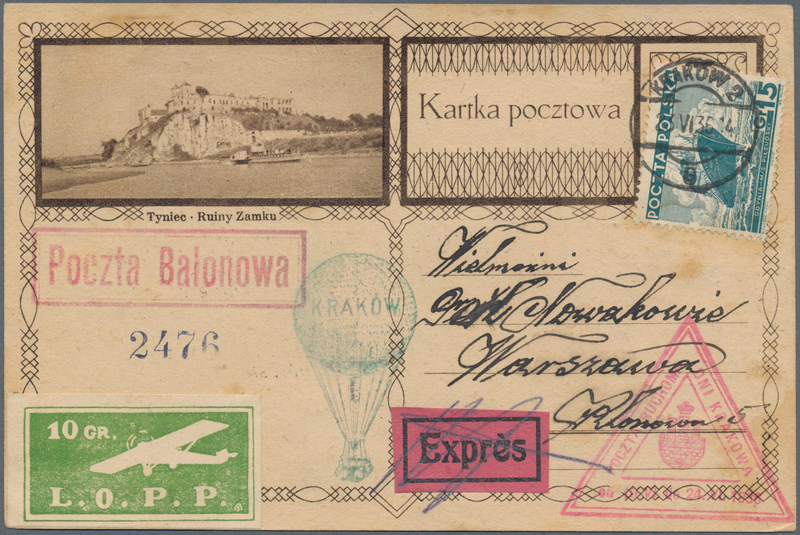 Historical item. 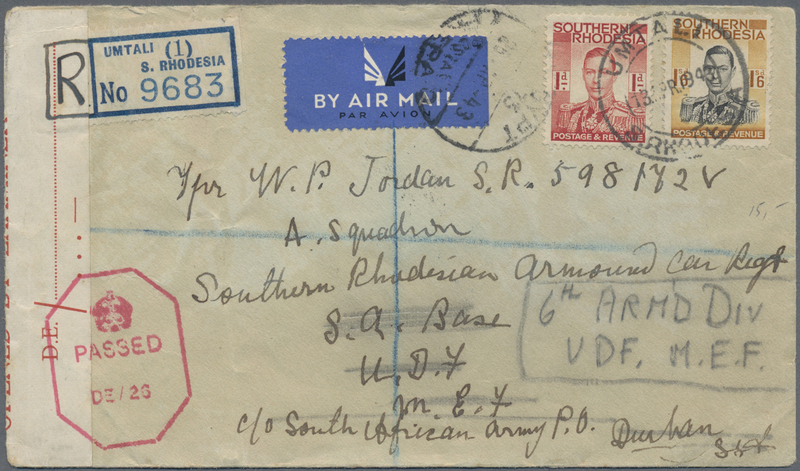 80128 Brief (cover) 172-79 vert. 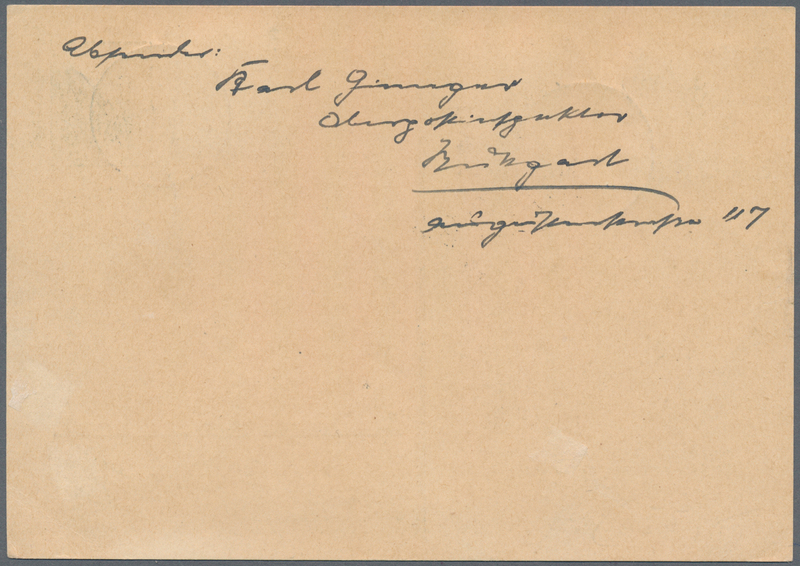 Pairs 1935, "S.W.A." 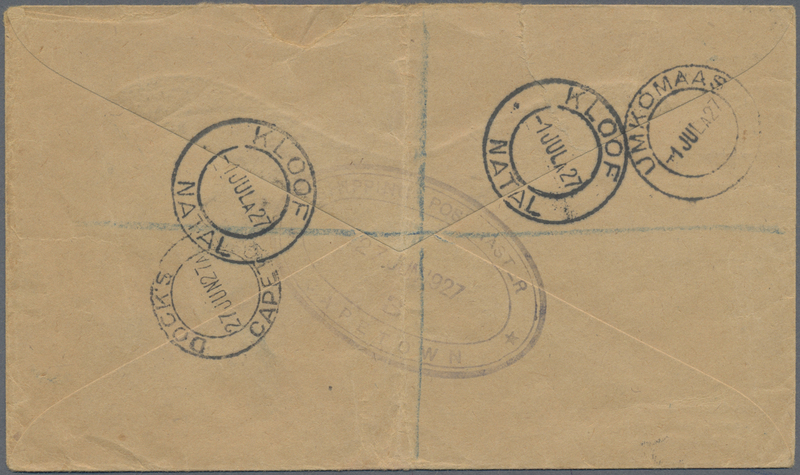 ½ d to 3 d. "Voortrecker Marken" set of eight values in four horizontal pairs on airmail letter sent from "WINDHOEK 28.6.36" to Kronberg, Germany and forwarded to Gagenau. 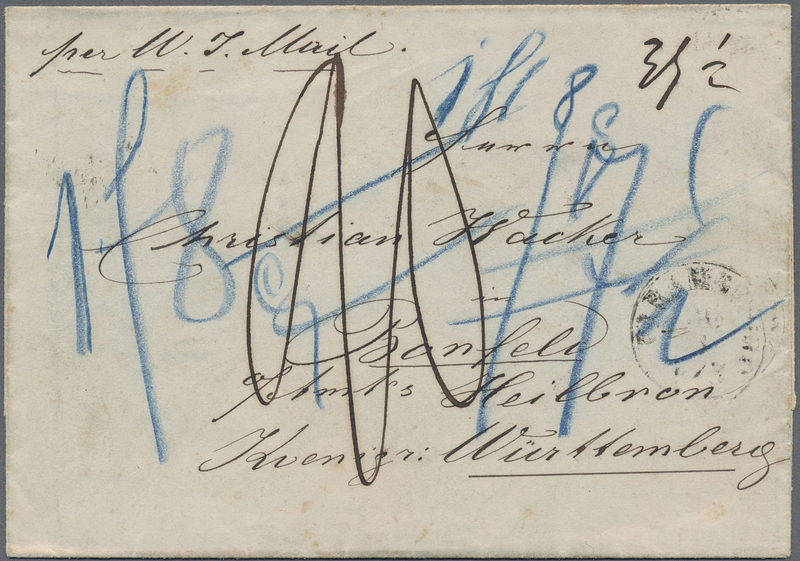 80129 Brief (cover) 1873, stampless folded letter-sheet from PARAMARIBO, 20/3 1873, along with manuscript routing inscription "per W.I.Mail" and various taxation markings addressed to Bonfeld in Württemberg, on reverse triple-line transit r.p.o. CLEVE-COELN, 14 4 III. 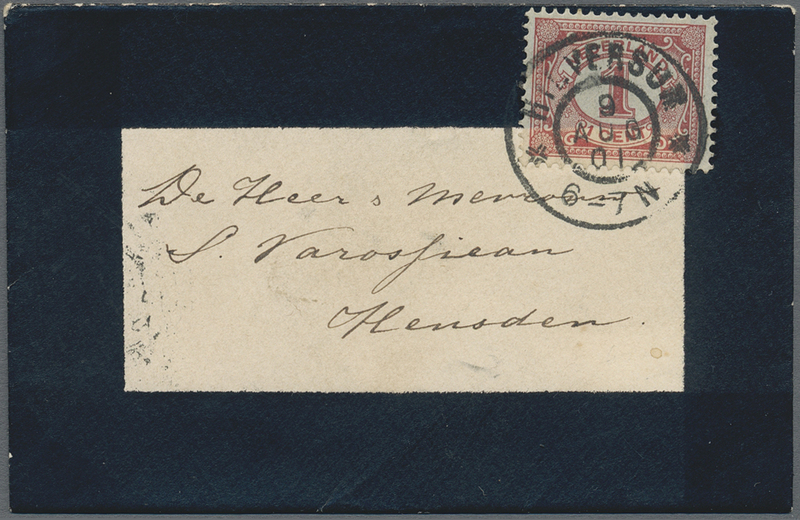 VERY UNUSUAL AND RARE TRANSATLANTIC MAIL COVER ÷ 1873, Faltbriefhülle aus PARAMARIBO, 20/3 1873, mit Leitvermerk "per W.I.Mail" und verschiedenen handschriftlichen Tax-Vermerken, nach Bonfeld in Württemberg adressiert, rückseitig Transitstempel der Bahnpost L3 CLEVE-COELN, 14 4 III. AUSSERGEWÖHNLICHE UND SELTENE TRANSATLANTIK-POST! 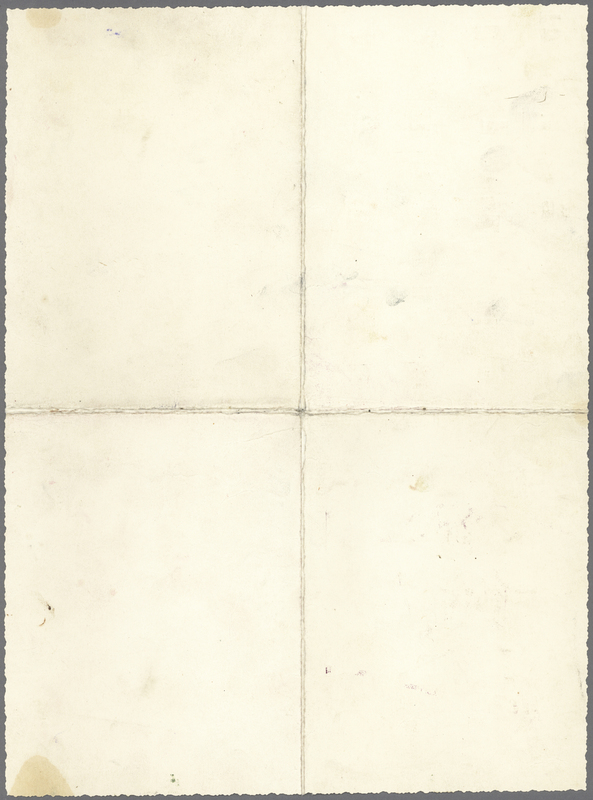 80131 ungebraucht ohne Gummi (unused without gum) (*) 1931, postage stamps: country and people, 44 colour samples of a series of postage stamps with instructions to the printer, glued on cardboard, traces. 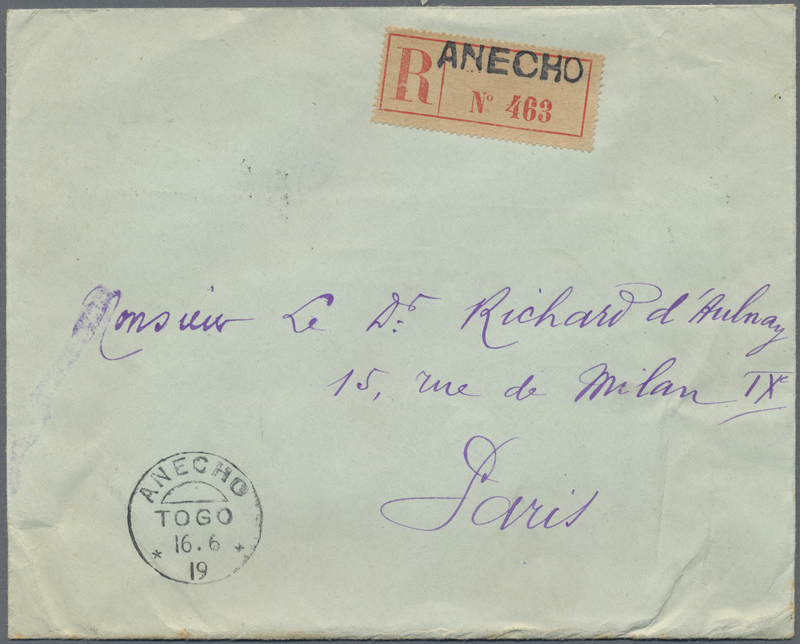 80132 Ganzsache (Complete) 1881, stationery envelope 5 C. Numeral variety half value stamp on reverse. Interesting and possibly unique piece. 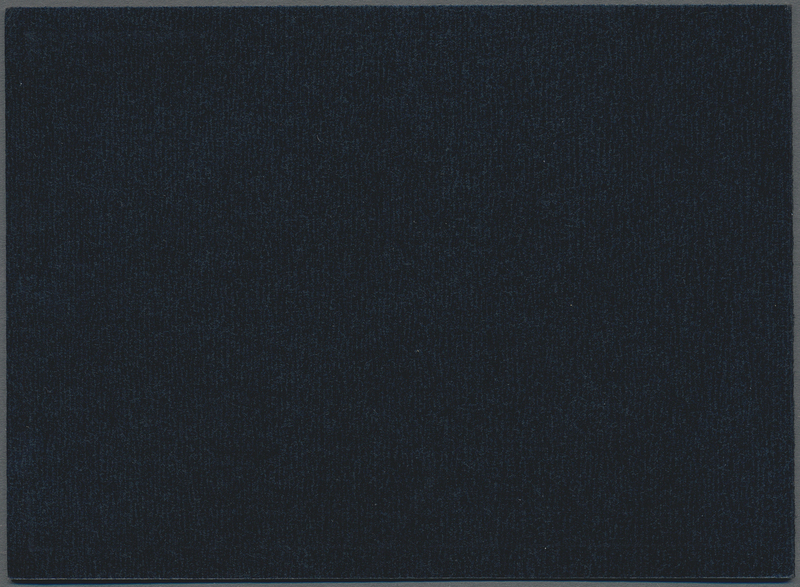 80133 Brief (cover) 328 (Sc. 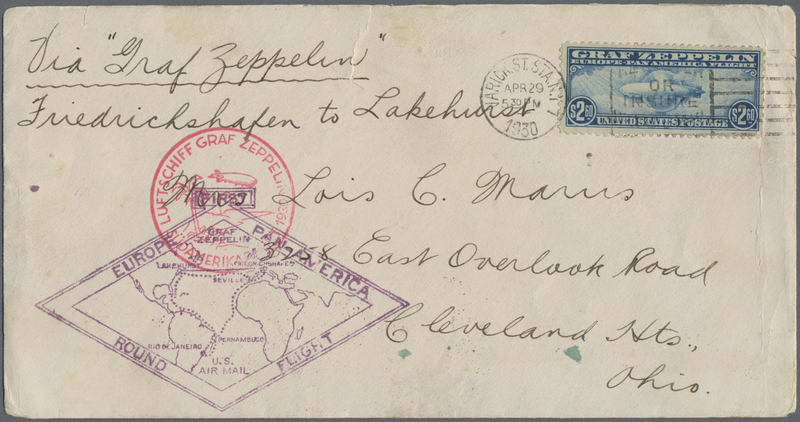 C15) 1930 Zeppelin stamp $2,60 blue used on Zeppelin "Europe-Pan America Round Flight" cover from New York to Cleveland, Ohio via Zeppelin's South America Flight, cancelled by '29 April 1930' datestamp, diamond 'Round Flight' cachet in violet and circled 'Zeppelin Südamerikafahrt' cachet alongside, green Lakehurst-Zeppelin Round Flight duplex datestamp on the reverse. 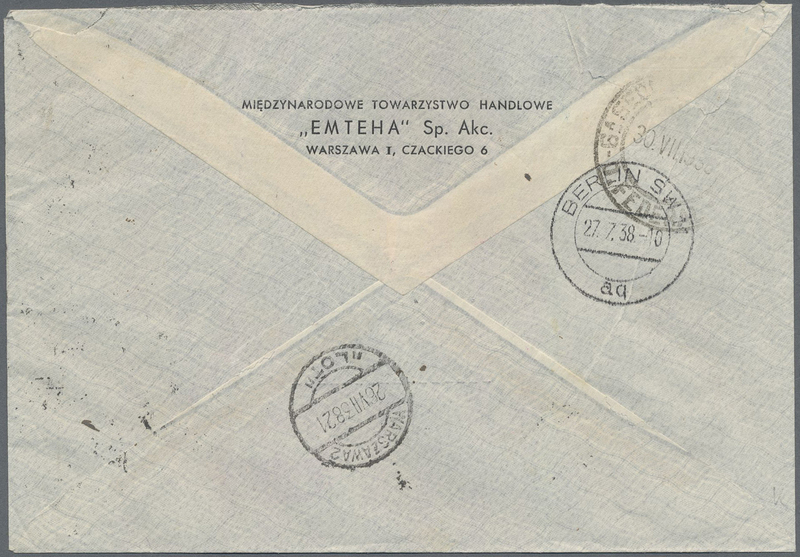 Cover slightly crased and a short tear at top but a good stamp used on cover. 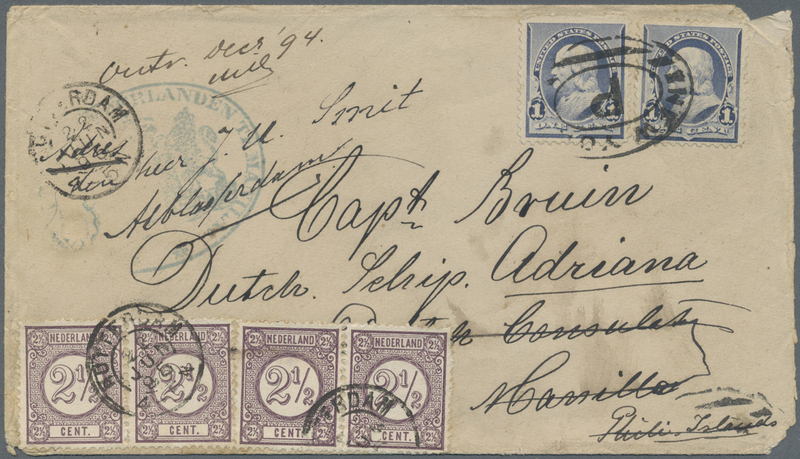 80134 Brief (cover) 1894, cover from NEW YORK, addressed to a Dutch Captan on ship "ADRIANA VIA DUTCH CONSULATE", Manilla, Phillipines. 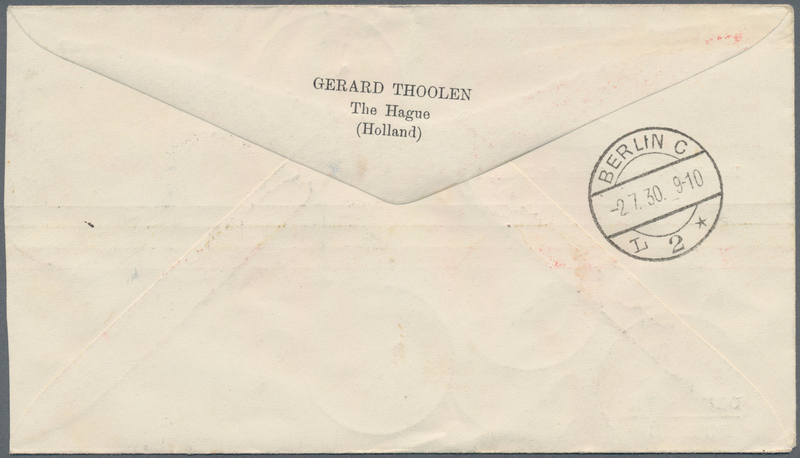 On front green Consular cachet handwritten "received Dec. 94" with new address forwarded to ROTTERDAM by diplomatic pouch and franked there with four 2 1/2 Dutch stamps cancelled "ROTTERDAM 22 JUN 95" sent via Dordrecht to Alblasserdam. 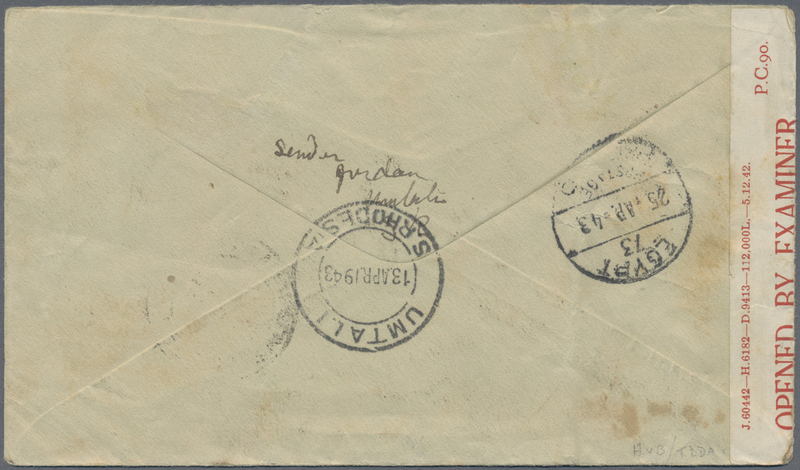 Very rare mixed franking and early post to the Phillipines. 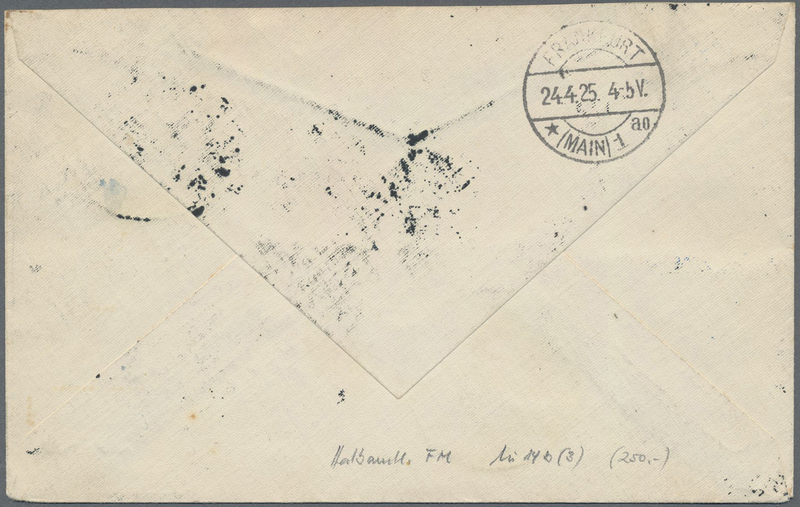 80135 Brief (cover) 1939, TIN CAN MAIL TONGA: Envelope bearing 5x US 3 Cent sent from "TONGA JAN 23 1939" to Ningfoo with ca. 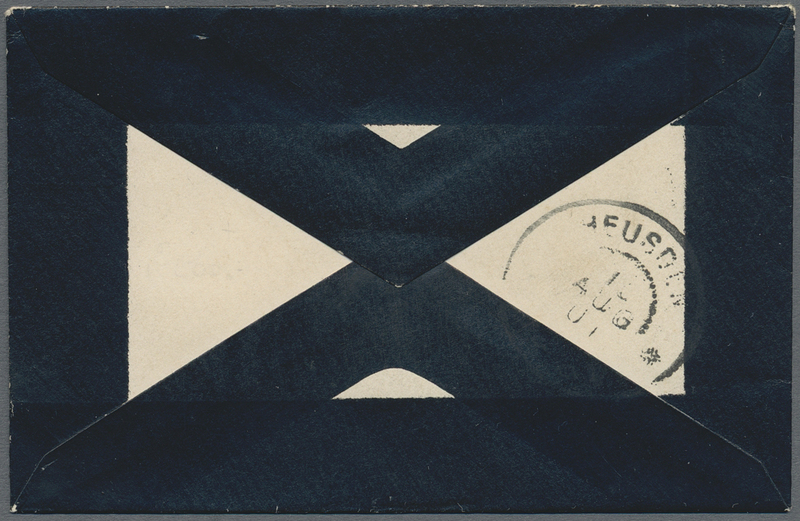 14 different tin-can cachets or transitmarks on front and back. 80136 1976. UNCTAD. Approved die proofs for the issues of New York (Mi #295/96) and Geneva (Mi #57). 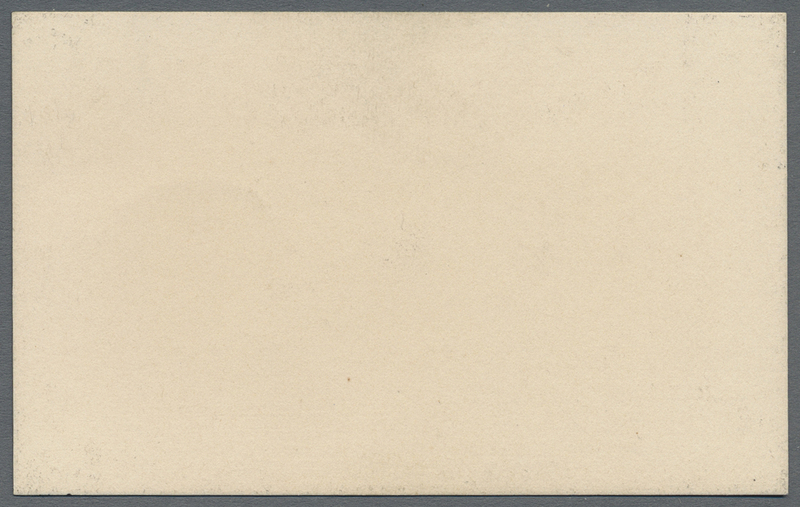 Mounted together in a Courvoisier presentation folder. VARIETY: both values of the New York issue lacking face value! 80137 1976. Drug Abuse. 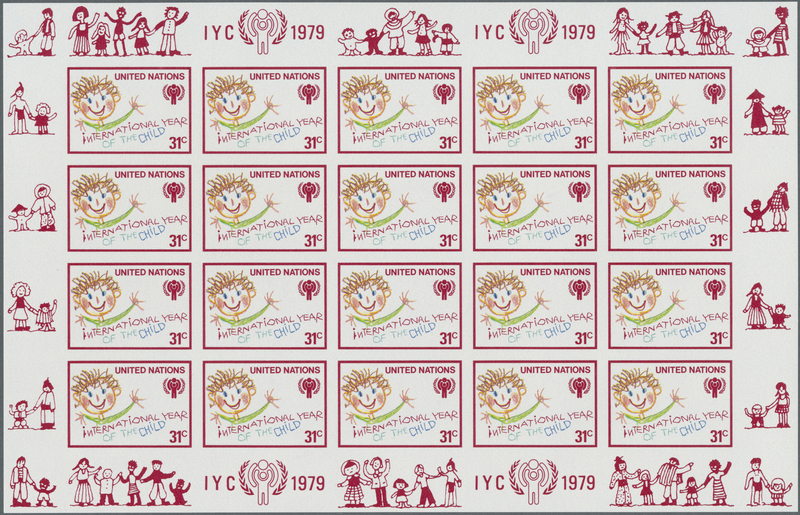 Die proofs for the issues of New York (Mi #256/57) and Geneva (Mi #32). 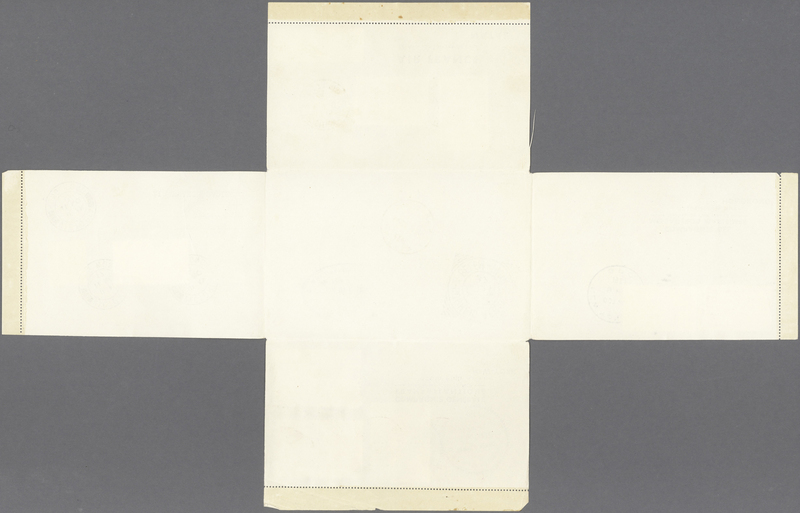 Mounted together in a Fournier presentation folder. 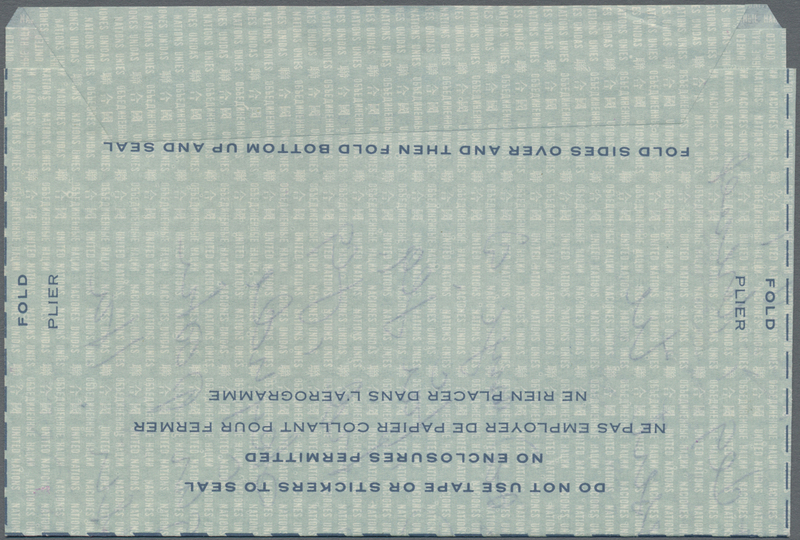 VARIETY: face value 9c instead of issued 8c of New York issue. 80138 1988. Human Rights. Approved die proofs for the issues of New York (Mi #569, s/s #10), Geneva (Mi #171, s/s #5) and Vienna (Mi #87, s/s #4. 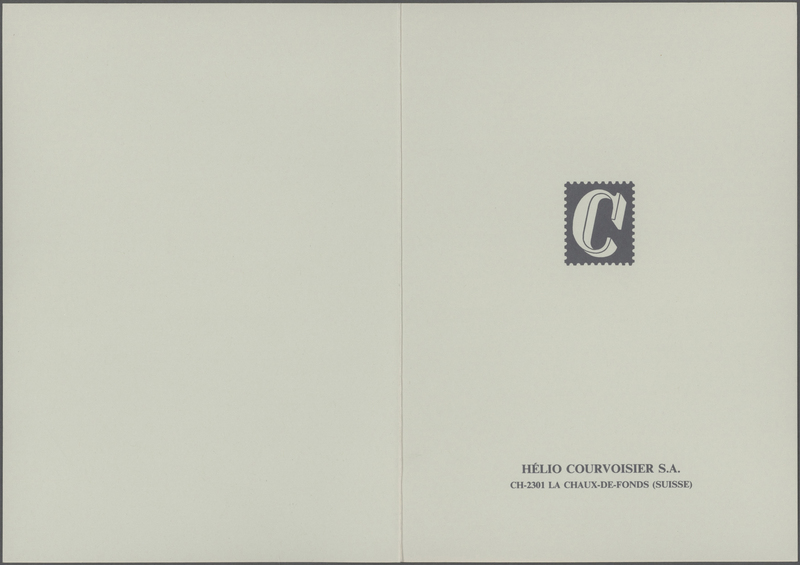 Mounted together in a Courvoisier presentation folder. 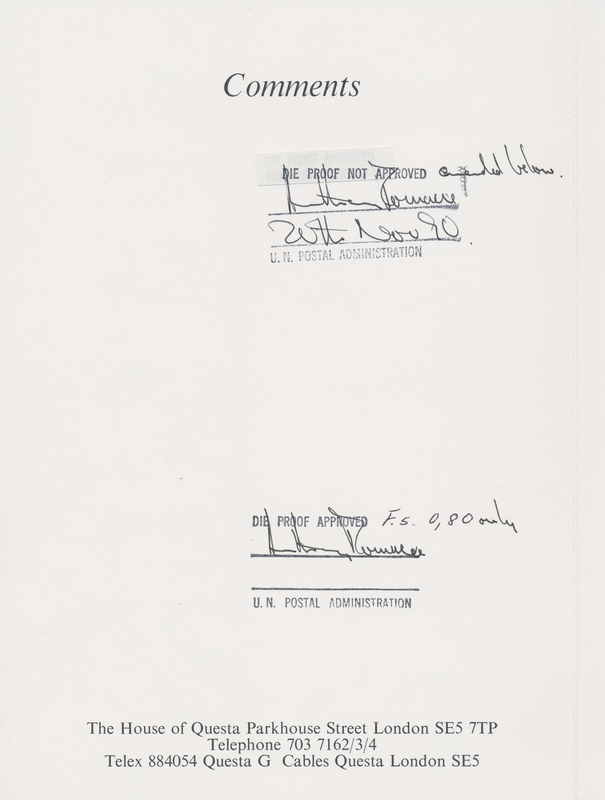 80139 187 var 1967. Disarmament Campaign. Die proof for value showing 5c face value instead of 6c. 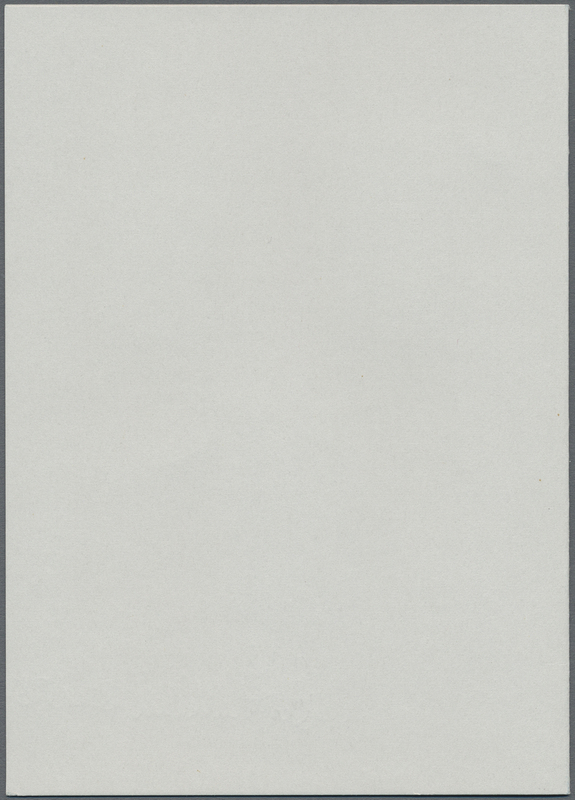 Mounted in a Fournier presentation folder. 80140 187 var 1967. Disarmament Campaign. 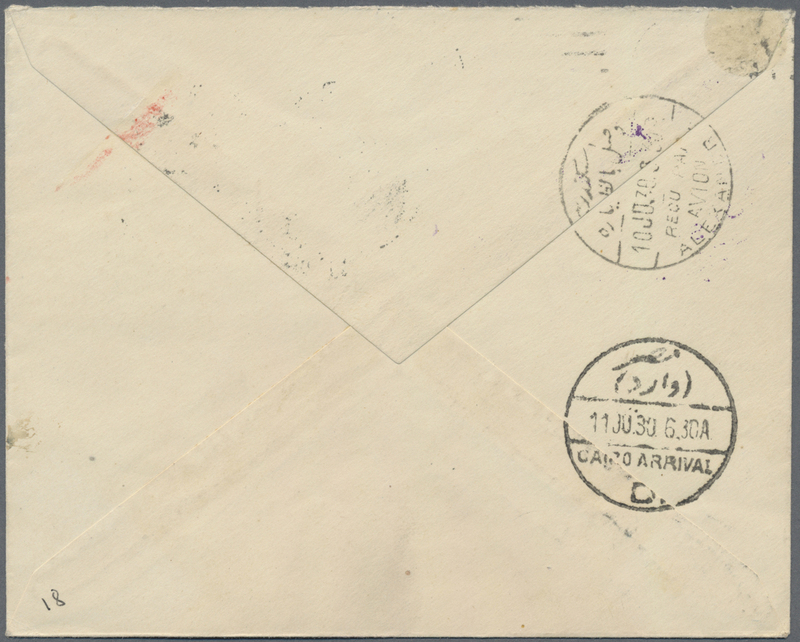 Die proof for value showing 5c face value instead of 6c. 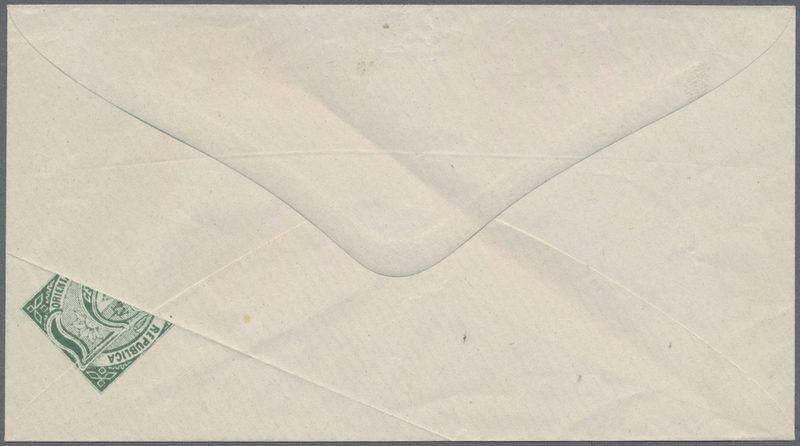 Mounted on a Thomas de la Rue presentation card. 80142 216/17 var 1969. 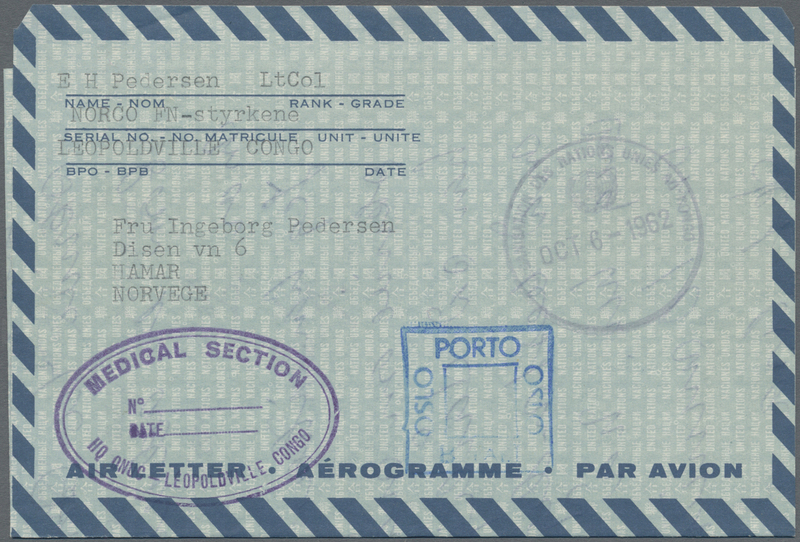 Die proofs for the ILO issue (Mi #216/17). 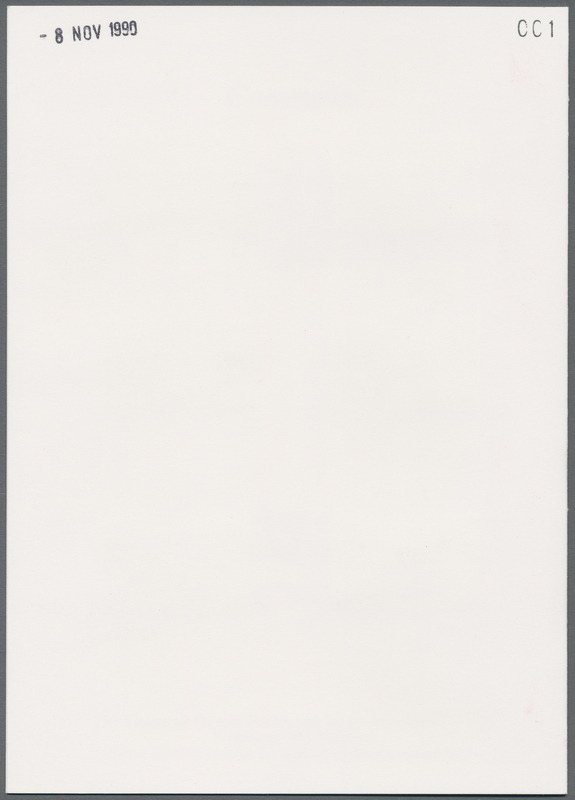 Mounted together in a Rosenbaum presentation folder. 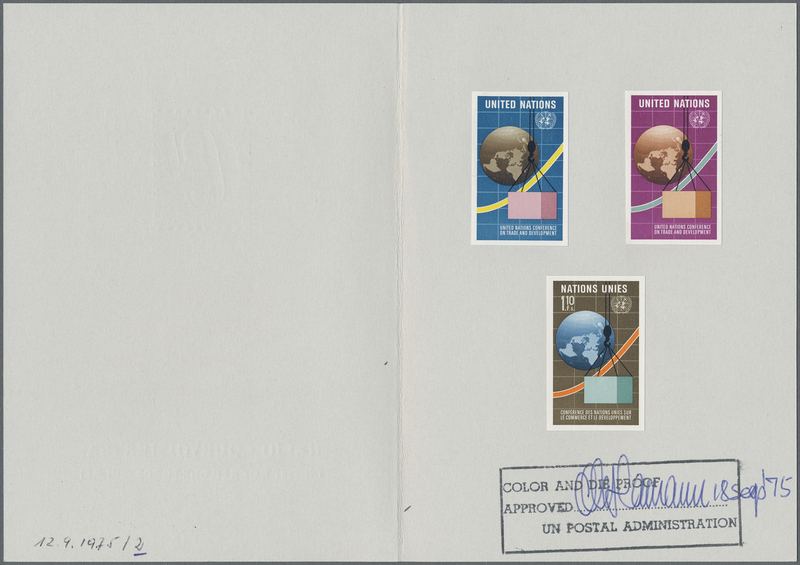 VARIETY: backdrop of the 20c value colored lilac instead of issued red backdrop! 80143 1974. 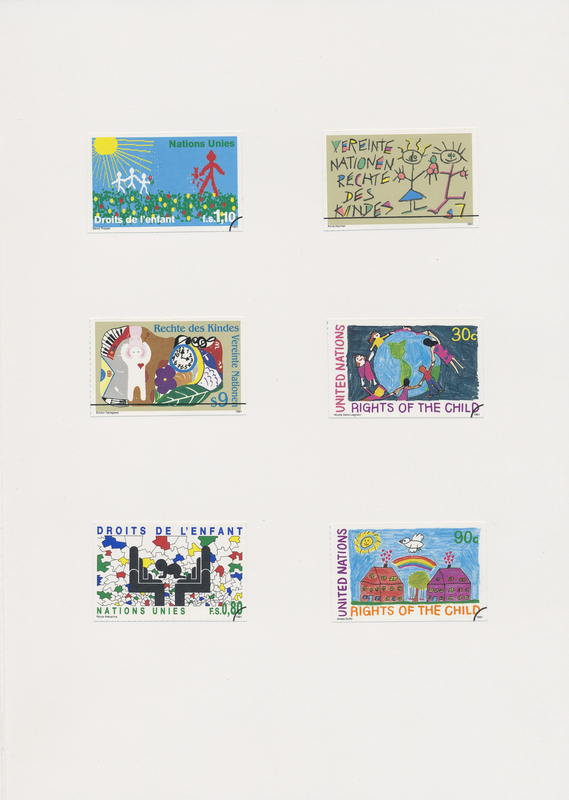 Works of Art for UN. 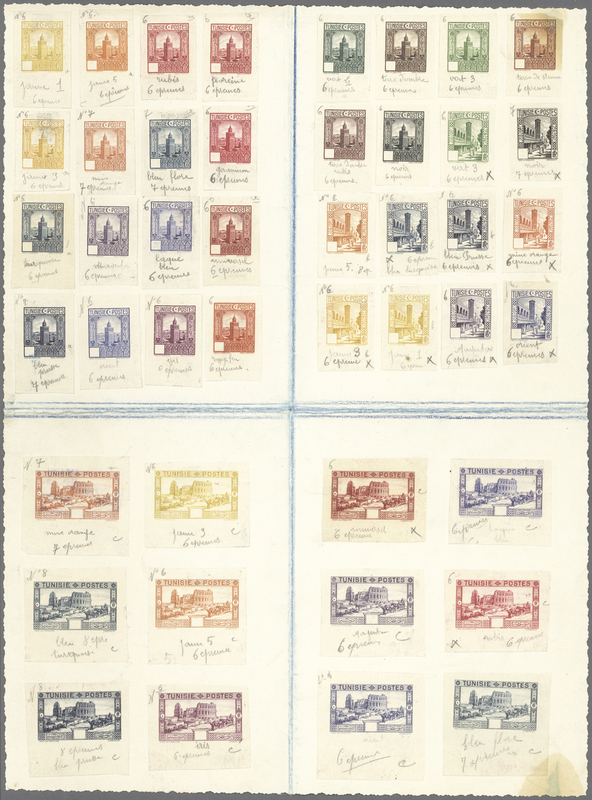 Die proofs for the issues of New York (Mi #267/68) and Geneva (Mi #41/42). 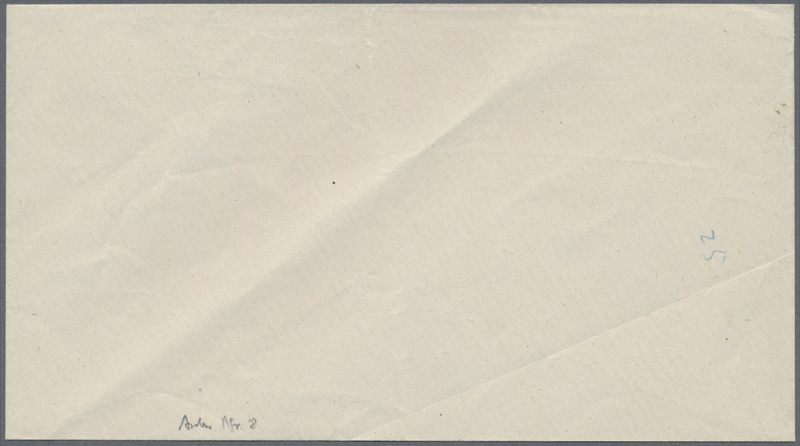 Mounted together in a Fournier presentation folder. 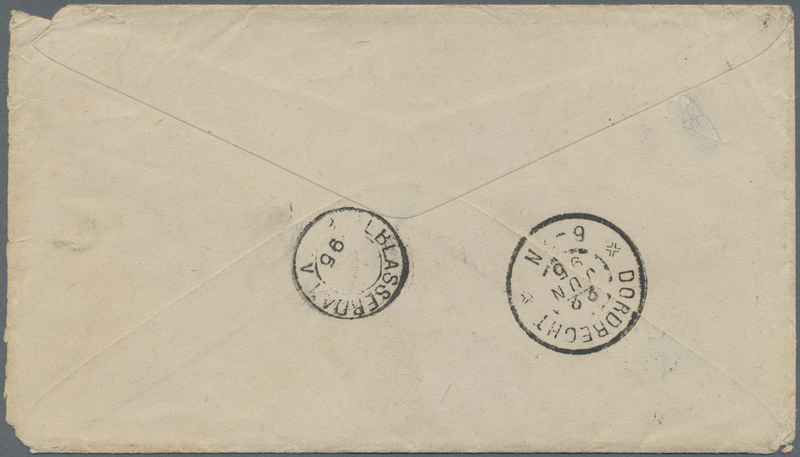 VARIETY: face value 15c instead of issued 18c of the New York issue. 80145 1981. 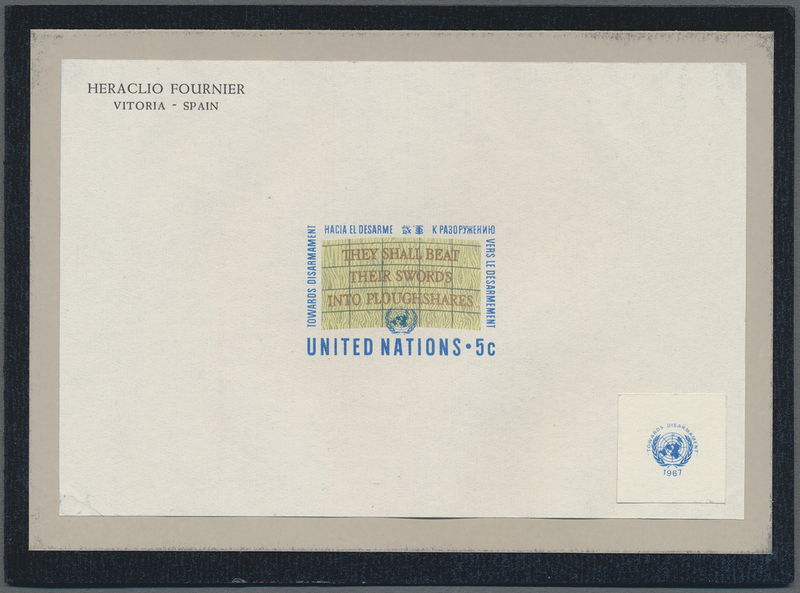 Flags of UN members. 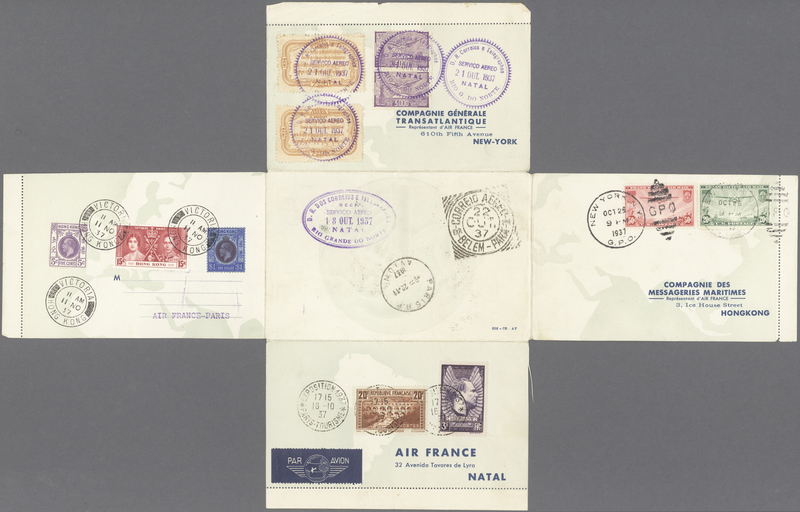 Die proofs for the issues of New York (Mi #373/80). 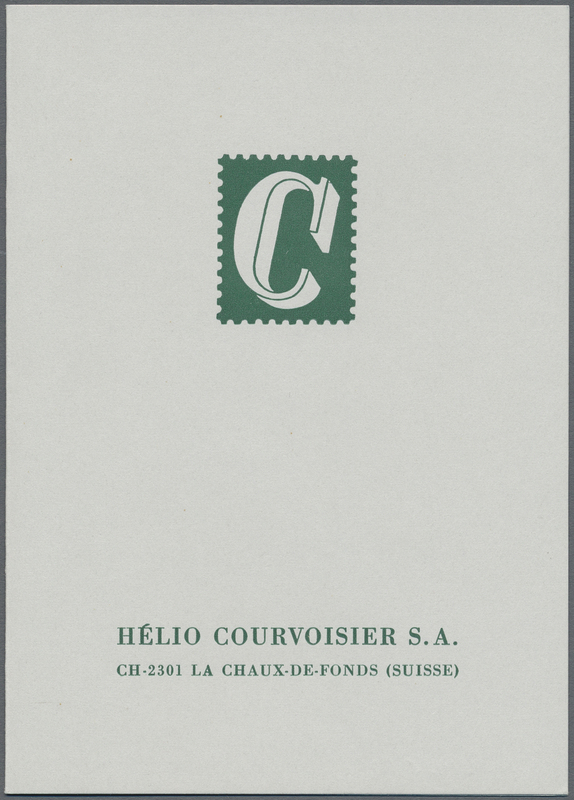 Mounted together on a Courvoisier presentation sheet. VARIETY: all face values 15c instead of issued 20c! 80146 1991. 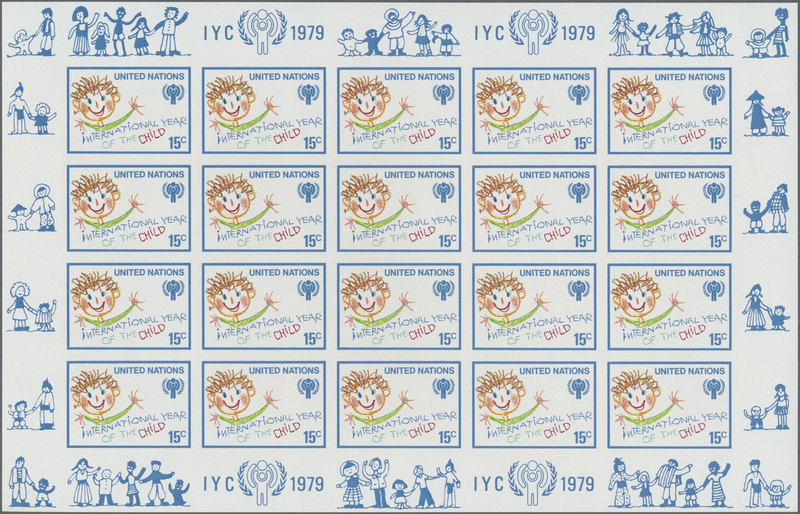 Rights of the child. 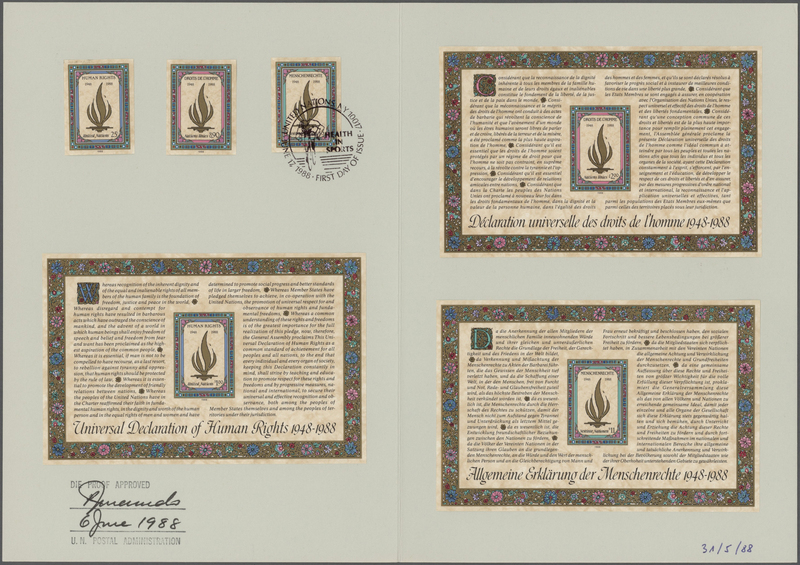 Die proofs for the issues of New York (Mi #615/16), Geneva (Mi #202/03) and Vienna (Mi #117/18). 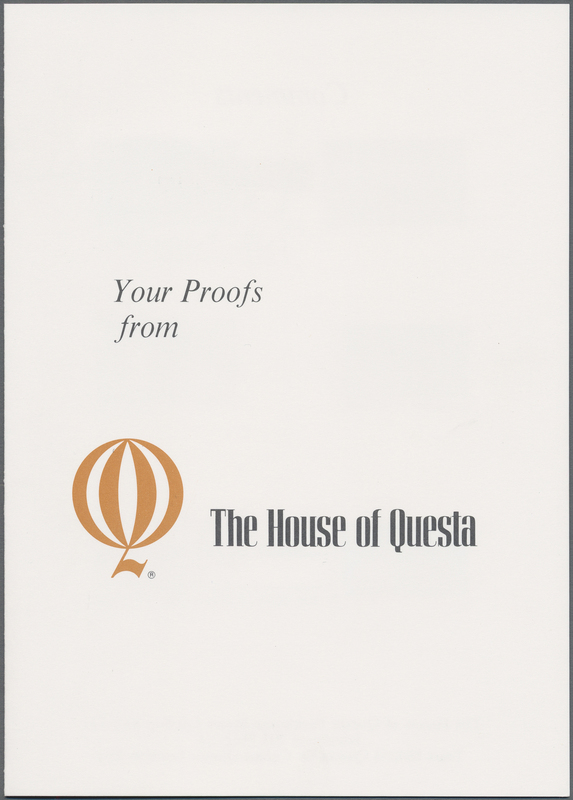 Mounted together in a Questa presentation folder. VARIETY: one value of the New York issue shows face value 90c instead of issued 70c! 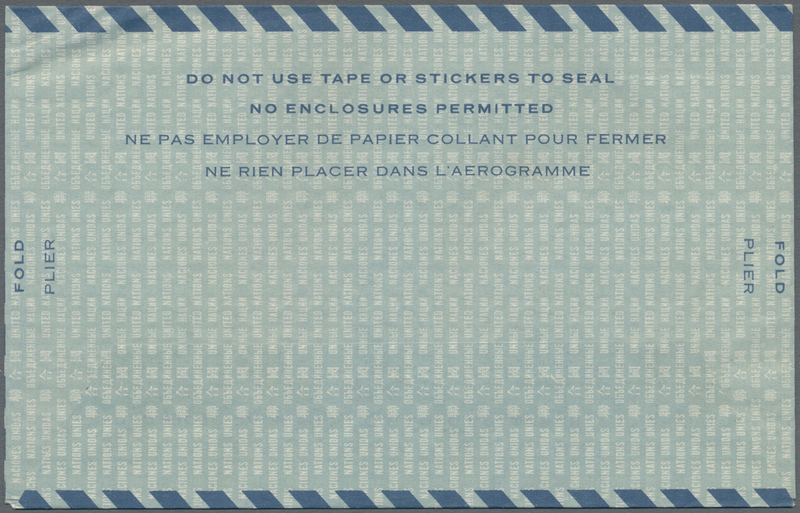 80147 postfrisch (never hinged) ** 767/70 proof 1998, Endangered Species (Goose, Galago, Malayan Bear and Butterfly) in an IMPERFORATE part PROOF PANE of '12' (four corner stamps missing) on presentation carton with hs. 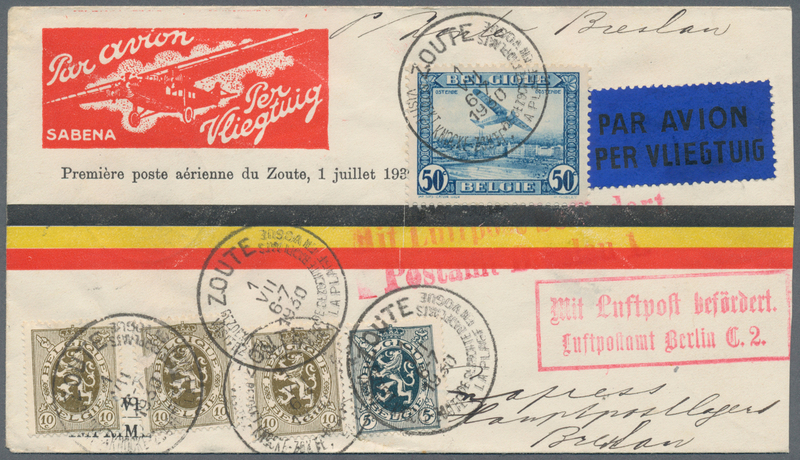 'DIE PROOF APPROVED WITH CORRECTIONS / UN POSTAL ADMINISTRATION' dated '21/12/97', affixed at top otherwise MNH, unusual and very scarce! 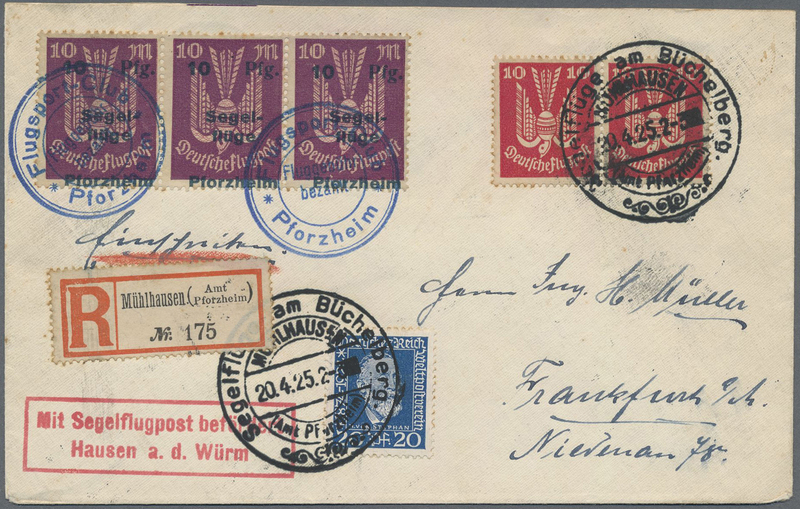 80149 Ganzsache (Complete) 1936, picture card franked with 15 Gr. with "Poczta Blonowa" with balloon cachets from KRAOW and 10 Gr. 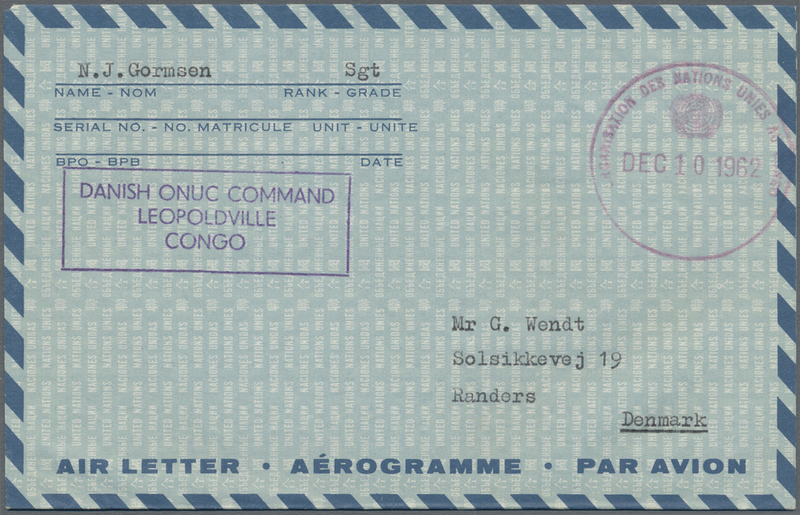 Vignette "L.O.P.P." 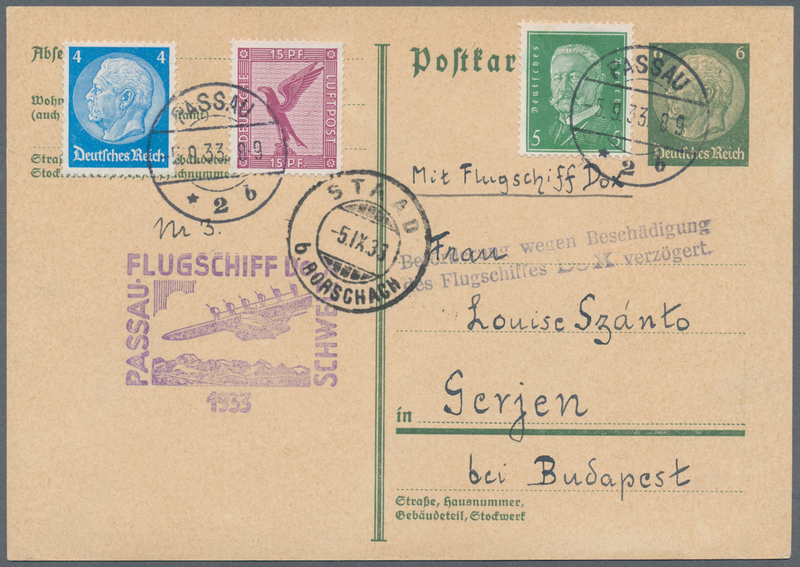 80152 Brief (cover) 1930, two highly decorative special airmail covers by SABENA one to Berlin and one to Nürnberg with German confirmation marks. 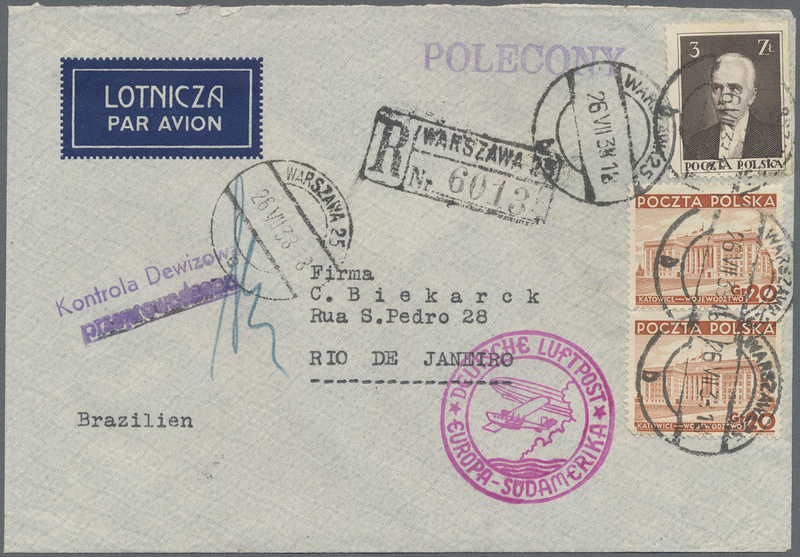 80153 Brief (cover) 228+231 of Poland 1930 First Flight Warsaw-Cairo cover franked by Poland air stamps 10g. and 30g. 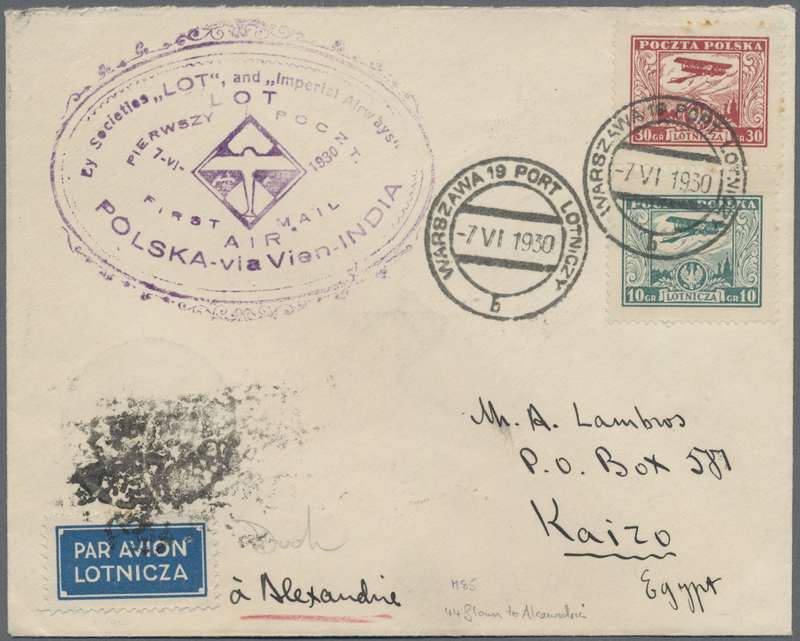 tied by Warsaw '7.VI.1930' cds, large oval First Flight cachet alongside, Alexandria transit dater and Cairo '11 June' arrival cds on the reverse, fine. 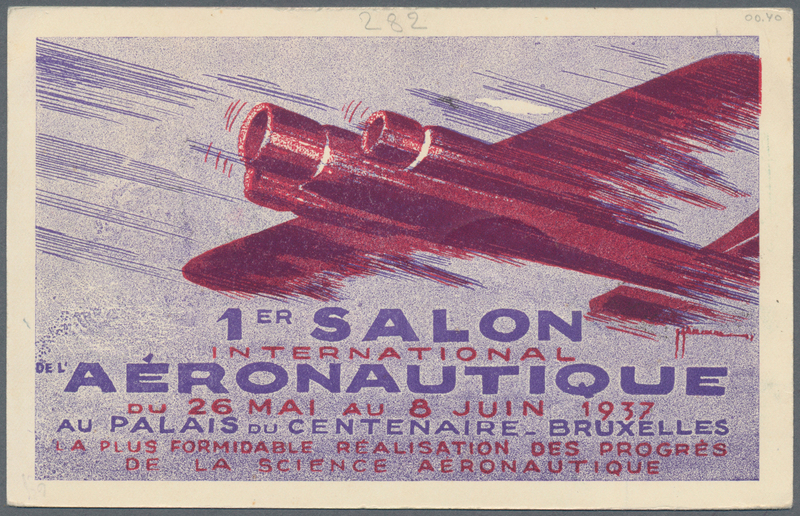 80154 Ansichtskarte (Picture postcard) 1937, decorative advertising card for "1er Salon del Aéronatique" on reverse French and Belgian franking and red propaganda cachet. 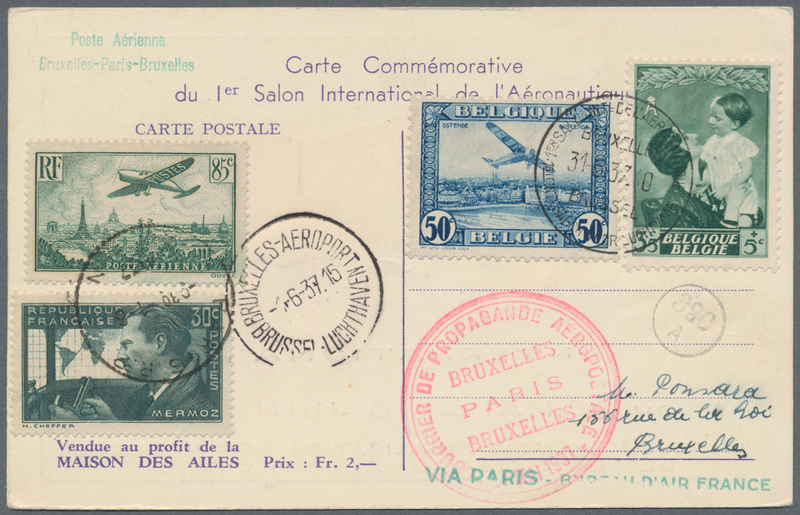 80156 Brief (cover) Flugpost (Flight cover) 1937, "ROUND THE WORLD FLIGHT" starting in PARIS 16-10-37 with stations in NATAL, BELEM, NEW YORK, HONG-KONG with arrival in Paris again on NO 22 1937. 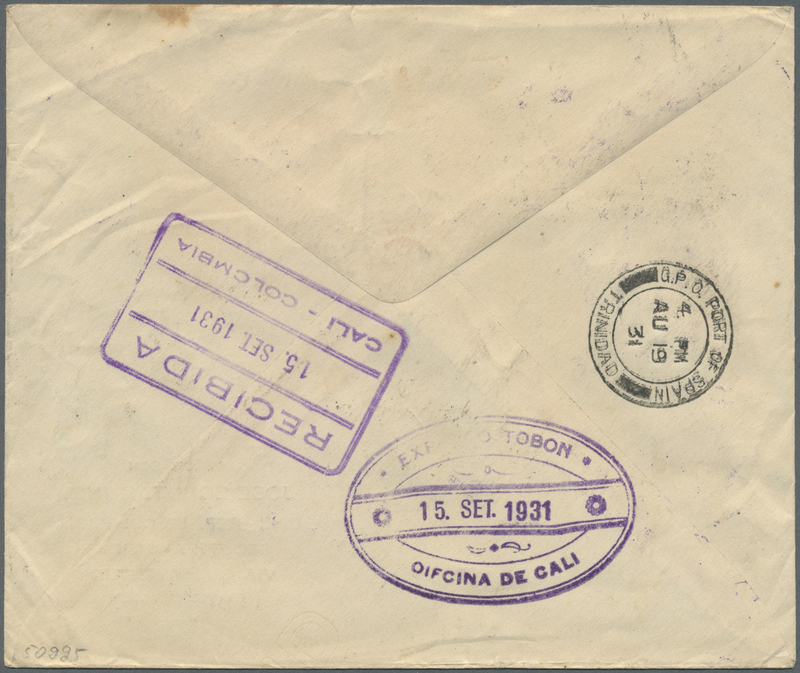 80158 Brief (cover) 1931 EXPRESO TOBON: DOX cover from Rio de Janeiro to Cali, Colombia via Buenaventura per Expreso TOBON, franked by six Brazil stamps tied by Rio '4.VIII.31' cds in combination with "EL EXPRESO TOBON" stamp of 6c. 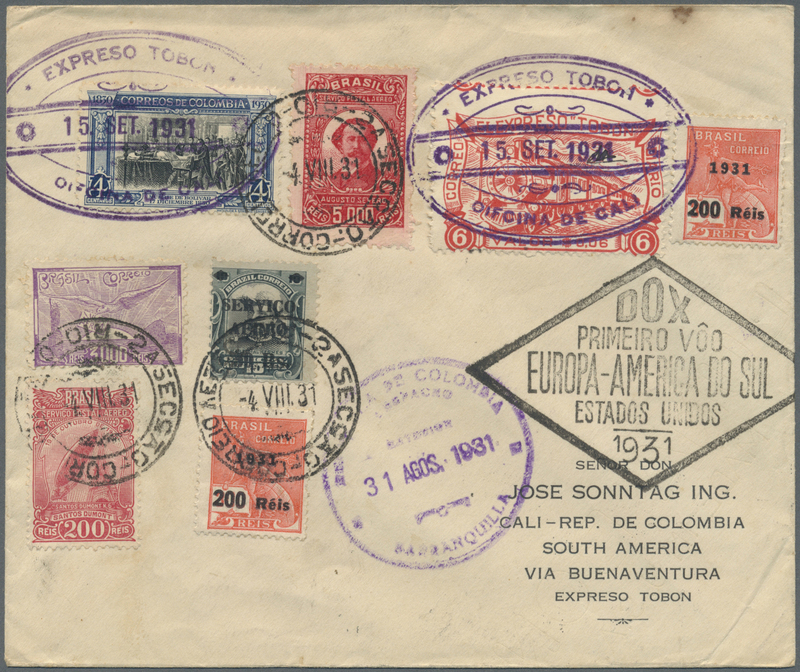 in red plus further Colombia adhesive both tied by special "EXPRESO TOBON Oficina Cali 15. SET. 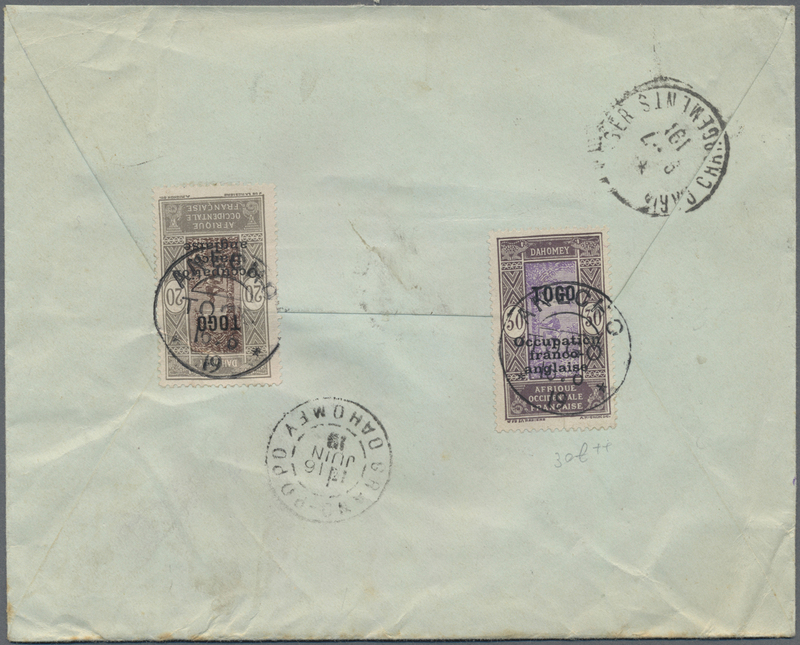 1931" oval d/s in violet, also with the special "DOX/PRIMERO VÔO/EUROPA-AMERICA DO SUL/ESTADOS UNIDOS/1931" h/s in black and '31 Aug 31' Barranquilla transit cds on front, and on the reverse with Port of Spain, Trinidad transit cds, and '15 Sep 31' arrival datestamp. The finer of ONLY TWO COVERS KNOWN. 80159 Ganzsache (Complete) 1933, 6 Pfg. 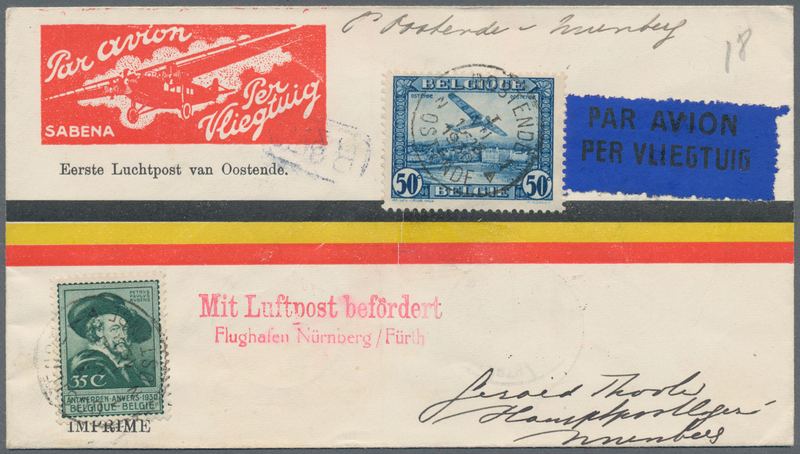 Hindenburg GanzsachenkarteundZusatzfrankatur ab PASSAU "*2b 5.9.33" mit Bestätigungsstempel "FLUGSCHIFF DO-X PASSAU-SCHWEIZ" und L2 "Beförderung wegen Beschädigung des Flugschiffes DO-X verzögert". 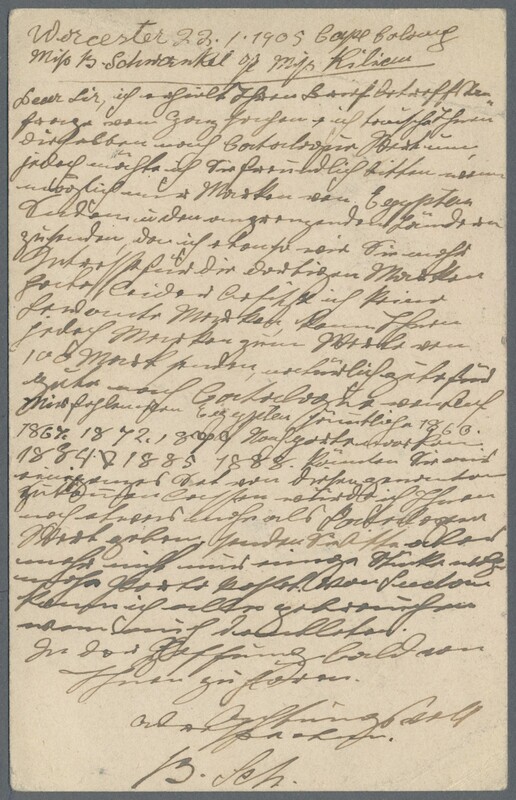 Schweizer Ankunftsstsempel Staad b. Rorschach.